.NET is a software framework which is especially designed to run on Microsoft windows. One of its main feature is language interoperability. .NET framework contains huge base class library that provides network communication, numeric algorithms, database connectivity and cryptography among others. Other additional features of .NET frameworks base class library are user interface, database access and web application development. .NET Application Development suits the need for creating web based and desktop based application which helps to make complex application look easier. It also ensures security and rapid development with its versatile and dynamic library. Looking for an affordable .NET application development services? Haven’t found yet? Relax, our .NET professional team at TechSupportDubai is at your rescue. Our experts are well skilled about the process and can develop new application using a number of programming platforms for Windows platform. We focus in providing you the most appropriate solution for your business and help you to explore new limits of success. Unaware of the advantages of .NET Application Development? For further details, you can interact with the experts at Tech Support Dubai . We provide the best .NET application development in Dubai. Our professionals have gathered knowledge about .NET application and hence can guide you in the best way. Tech Support Dubai consists of a team of professionals who excel in creating a unique application with .NET. We also create some amazing mobile apps, Windows Store apps, and desktop apps. We have a separate team of talented experts who use the .NET applications and Visual Studio skills. We are capable of developing some stunning cross platform applications using .NET. The .NET experts at Tech Support Dubai design and deliver applications for almost every business needs. We not only develop gaming apps or utility apps but also engage in fun and entertainment apps and create/design customized apps for your specific requirements. 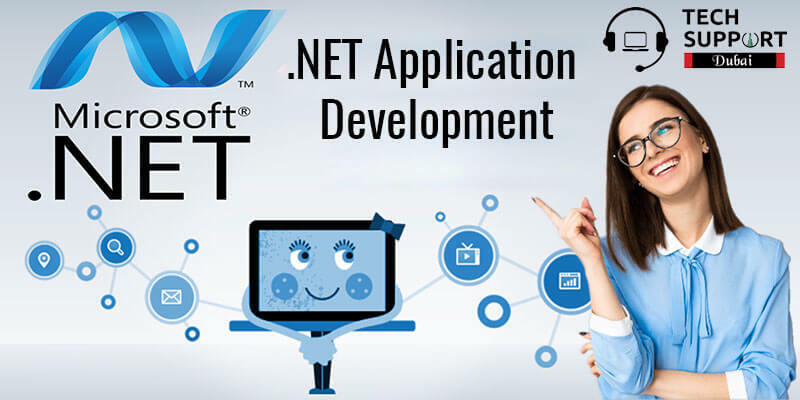 Hurry and contact our experts to avail the best service for the development of .NET application. If you are searching for affordable .NET application development services in Dubai, the experts at Tech Support Dubai are the best to choose from. Just place a call at our helpline number: 042053349 and interact with our highly qualified experts. We will guide you with the best techniques and methods to develop an exclusive application with .NET. Our specialty is that we listen to our clients and then to the needful. We understand your requirements and then come up with solutions accordingly.